Zachary Caruso is a Student Ambassador for the Composites Technology Program at IYRS. My name is Zachary Caruso. I am from Kingston Massachusetts, a small town on the south shore. I grew up sailing at Duxbury Bay Maritime School in the neighboring town and eventually I got my first job there as a sailing instructor when I was 15. I have always been one to enjoy creating things, working with my hands, engulfing myself in a project. One project that I am particularly fond of is my sailboat, it is a flying Scott, and it needs quite a bit of cosmetic work. I recently towed it behind my Subaru and brought it to Florida, because I just could not leave my project behind! I am a passionate person and I typically allow my passions to drive the direction of my life. After spending 2 years at school in Florida I decided that the typical college experience was no the best fit for me, and after some real soul searching I decided to return home to Massachusetts. After working on the maintenance staff at the same maritime school I got my first job at, my sights began to focus on furthering my skills in the boatbuilding trade. IYRS came highly recommended by many people, by those who were in the industry and by many who had friends or family that had great success after completing their time at IYRS. Flash forward to my first week at IYRS! I was so nervous! Meeting all new classmates and Instructors was intimidating, I had moved from my home in Massachusetts to a brand new place in Newport. With all this change I wondered how I would ever feel at home and relaxed again. Not too long after my first week I began to feel very comfortable with my classmates, joking around, having fun, and learning brand new things everyday. Now as we approach the two month mark I feel completely at home in the shop, and the whole composites crew has begun to feel like a family. 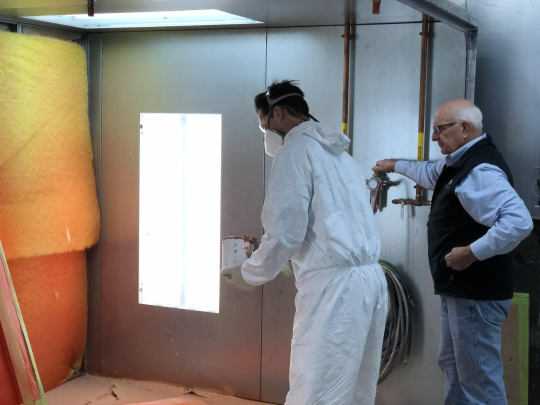 Here Kyle (Left) is getting some advice from Bob (Right) on gel coating Techniques. 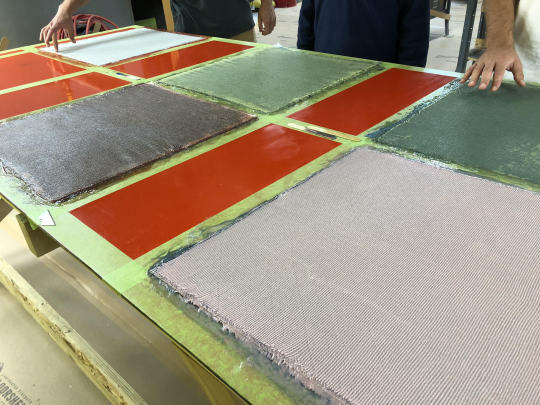 Here is one of our earlier projects, where we made fiberglass panels with alternating colors, this allowed us to practice scarfing repairs with a clear representation of each layer.